This is one of those super simple recipes that deliver a ton of flavor, turning a mid-week dinner into a special event. Since seafood in general doesn’t need to be marinated for a long time, you can do the whole prep after arriving home from work. But, if you want to make things even easier, make the marinade, clean the shrimp early in the morning, and keep both items in the fridge until showtime. Since we have the luxury of coming home for lunch every day, that’s when I normally get this type of prep work done. A small investment of time at noon, and voilà: painless dinner later in the evening. Combine the olive oil, scallion whites, red pepper and lemon juice in a medium size bowl. Season the shrimp lightly with salt and pepper, add to the marinade. Toss to coat, and leave for 30 minutes in the fridge. 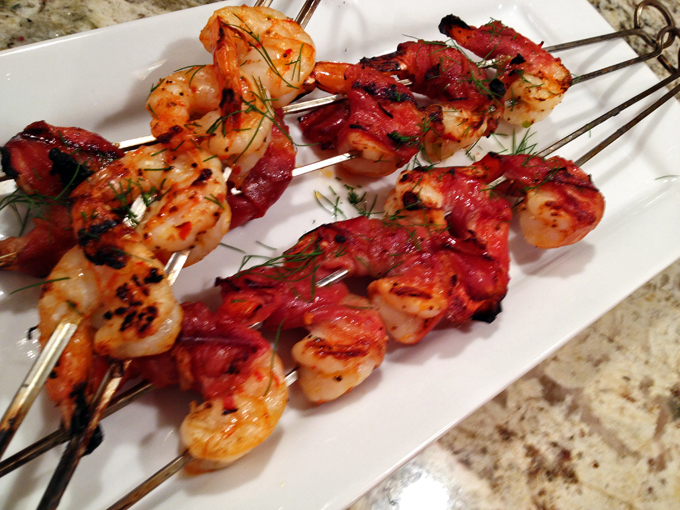 Wrap each shrimp with a slice of prosciutto and thread onto a metal skewer. If using wood skewers, soak them in water for a few hours. Grill the shrimp until firm and opaque, about 3 minutes per side. Transfer to a serving plate and decorate with sliced scallions, if you like. I had some fennel fronds in the fridge, that’s what I added. Comments: The Hungarian pepper I used for this marinade was a gift I mentioned in this post. I love its complex flavor and mild level of heat. I searched and it is available on amazon.com, but the price made me hyperventilate a little. Lucky me, I do have very nice friends… Red pepper flakes (or fresh Fresno peppers) can be used instead, of course. My package of prosciutto came with only 10 slices, so some of the shrimp (I actually cooked 14) went to the grill naked. They did not seem to mind, and we definitely did not mind either. I grilled those for about 30 seconds less on each side. I also like to use a double skewer, a trick that prevents the shrimp from spinning around and makes flipping a lot easier. Most recipes would call for bacon instead of prosciutto, but I don’t quite get that. By the time the bacon is properly cooked, seafood will be severely over-done. I find that prosciutto works much better, as all you need is to get some grill marks on it, so the timing can agree with the seafood wrapped inside it. Alternatively, if you prefer the flavor of bacon, you can pre-cook before wrapping delicate seafood with it. Check Melissa’s method with a click here. Our dinner that evening was a nice take on surf-and-turf… Juicy shrimp, and deliciously grilled hanger steak. Light, flavorful, and a breeze to prepare! Cannot beat that. These look amazing! Sounds like I need to order some Hungarian pepper also! This looks so delicious, Sally! You know, my mother and I just had that discussion yesterday, as we were watching tv, and something came up about bacon wrapped scallops. 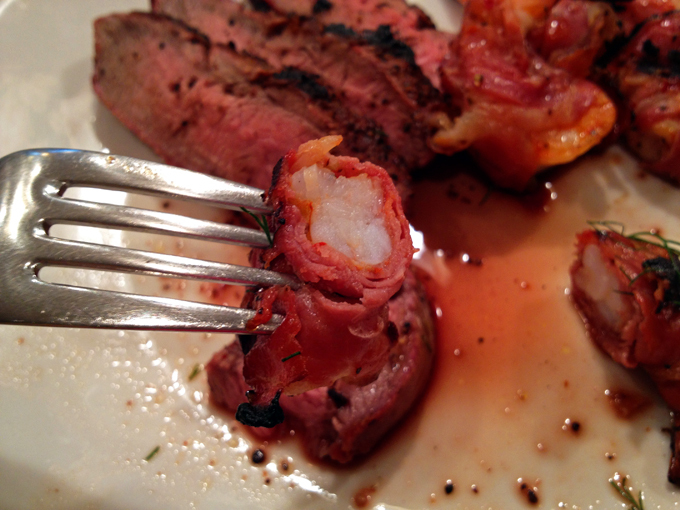 She said the same exact thing… how do you cook seafood that is wrapped in bacon? It would be severely overdone as you say. I said that maybe if you pre-cook the bacon, so that it is almost finished cooking, yet still pliable enough to wrap around the scallop, it would work. Something to try, anyway! Love painless dinners! ❤ Wonderful recipe. There’s not a lot you could do to a shrimp that would make me not enjoy it but this recipe is a taste treat combining the lean shrimp with a tiny bit of fat in the salty prosciutto. Bacon cooked so heading over now to Melissa to check out her method. Also….salmon curry?? Yummm! These look great…and pretty simple for a casual, but yummy dinner. Everyone wraps there shrimp in bacon now, but give me prosciutto any day. I like this Italianized version of surf and turf! The prosciutto sounds way better than whatever surf and turf is normally served with! Now this is my kind of surf and turf. Love how the prosciutto protects the shrimp and helps to keep it from drying out when cooking. YUM! Love Love this. I can only get 4 oz. packages of prosciutto where I live, so I completely understand that predicament. Poor naked shrimp. Love your marinade as well. Marinade was perfect for the shrimp, just a little spice… Hope you try this recipe, Mimi! A fantastic weeknight treat! I love it. We’re big shrimp fans as you know. This will be a winner with everyone. Thank you for the double skewer tip. That is genius!